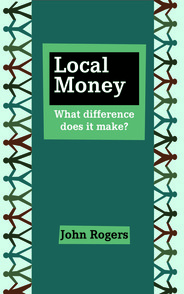 This pamphlet explains the practical differences between national and local money - how local currencies work, what they can do that national money can’t do, and why they are needed. "Must-read pamphlet. I found it clear, concise, assertive, inspiring and timely. Miraculously, John Rogers has distilled everything you need to know on this subject into this very easily digested little tome. Seriously impressive. I recommend it to Transition Initiatives and community groups anywhere that are looking at reasserting control over their local economy." Local money has been used for hundreds of years and throughout the world, yet very few of us understand what it’s all about. Recently, Bristol and Brixton launched their own ‘Pounds’, but why? We all need money – to stay alive, to buy essential goods and services. But when jobs and money are in short supply it’s largely because 97% of national money is controlled by the private banking industry. They trade, gamble and invest money where they can earn the biggest profit. And when the banks are in trouble so are ordinary people. By contrast, local currencies are owned by the community. They are designed to support local businesses, local jobs, local producers and services, local crafts and artists, community initiatives, charities, volunteers, etc. They create strong social networks and ensure that the community thrives even in a recession. By keeping the currency local, they protect it from speculators who will only invest if there is a profit to be had. "Must-read *Local Money* pamphlet. Miraculously, John Rogers has distilled everything you need to know on this subject into this very easily digested little tome.